It's overcast and raining in Austin today, but I photographed between storms. I'm so happy to have finished this baby quilt for a little girl in Kate Spain's Terrain fabrics. I also threw in some extra purples and pinks to up the girly factor. When I had to make (another) last minute run to the store for binding fabric, the gal ringing me up asked if it's hard to give away a quilt on which you've worked so hard. Between gifts and donations, this is my fifth quilt to give away in the last five months. Maybe it's the Terrain fabrics, but it is a little harder to say goodbye to this one. Luckily, the adorable two month-old receiving it more than makes up for the bittersweet farewell. I hope this quilt is loved hard and part of her life for a long time. 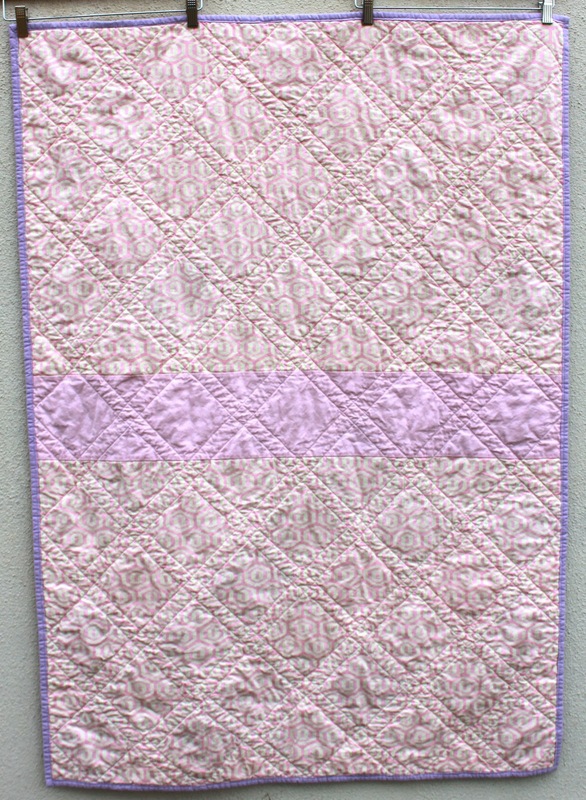 Having so recently finished the Empire baby quilt, binding this quilt went very smoothly. I mostly followed Sharon Shamber's approach, except I cut my strips 2 5/8" wide to begin with and used a 5/16" seam sewing the binding to the front of the quilt. I stitched in the ditch on the front to secure the binding to the back of the quilt. There were only three small places where the binding didn't catch on the back. I hand stitched those closed, ladder stitched the mitered corners, and I was finished. After washing, this quilt measured 51"x 36." I used Poly-Fil Cotton Classic Batting again. It's 100% unbleached organic cotton with a 1/4" loft. With this quilt finished, I can incorporate photos from making it into the final pattern. Get pumped! I can't wait to make it available through Craftsy post haste! This is the third quilt I've made from this pattern. I can't believe it. In other news, we had a great Austin Modern Quilt Guild meeting last night. I forgot my blocks to swap, so I'll show them off to you tomorrow and take them to the April meeting, instead! 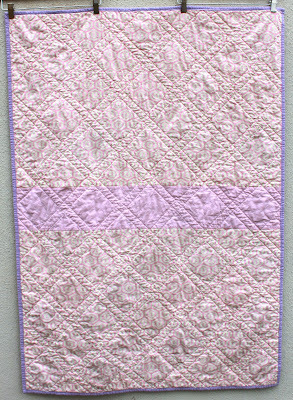 I'm linking up this finish with Amanda Jean on Crazy Mom Quilts and Megan on Canoe Ridge Creations! Love the finished product. Agreed about the AMQG meeting. Super fun! How cute! Love that Terrain! Very lovely - reminds me of stained glass (with white). It sounds like a winner if you've made three. 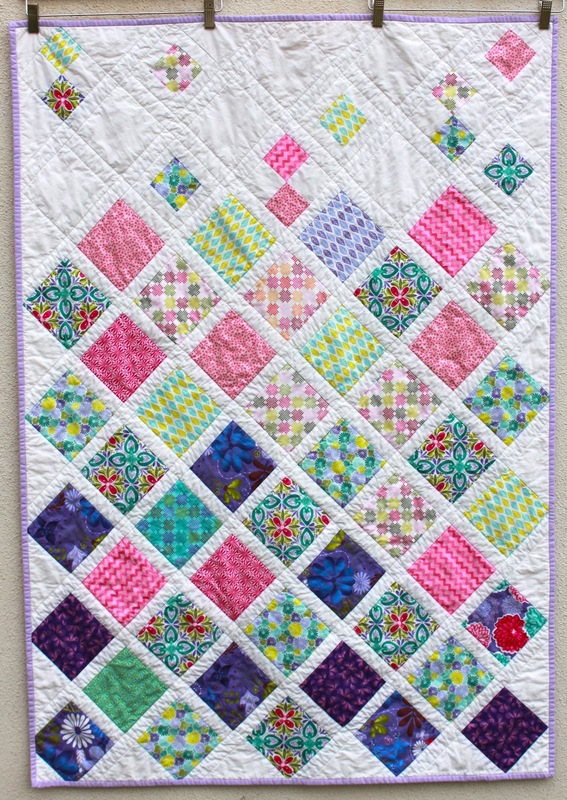 Congratulations and happy quilting! Oooh yes! I saw Lucy at Charm about You is making a Stained Glass quilt and that there is a QAL going on :-) I'd love to give one of those a go! They look so pretty hanging together like that! Makes me think that a larger quilt using the pattern in columns could be really fun. 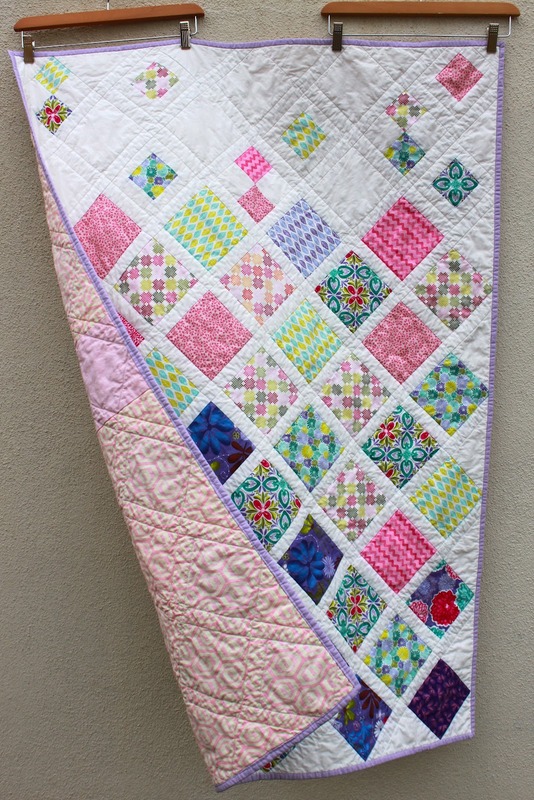 Your Terrain quilt is gorgeous! Very nice work! This is really beautiful - I am in the process of making one! :-) Thanks for sharing!